In 1964, Norman Rockwell painted "The Problem We All LIve With" for the cover of Look Magazine as an exploration of the realities of desegregation within the United States. By using a familiar and poignant painting as a starting point, I sought to create a backdrop in which participants could physically create and manipulate a composition. 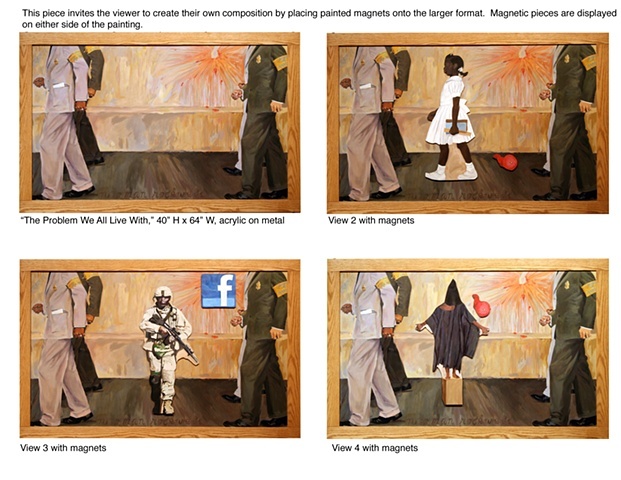 Each figure is magnetic and can be incorporated anywhere on the larger background. I included contemporary images that are also familiar, and in some instances, jarring in order to question which problems we, as Americans, also all live with.